Flowers give vent to thousands of emotions. The things that words fail to express flowers to in seconds. That is why, from time immemorial, flowers are considered to be the best gifts for all occasions. The only present that follows the footsteps of these fragrant companions, is cake. Cakes are in vogue as equally lovable gifts at all times. How wonderful would sound the combination of these two! You guessed it right. You can now order cake and flowers online. There are quite some options of this combo available. You may just want to take a look here. 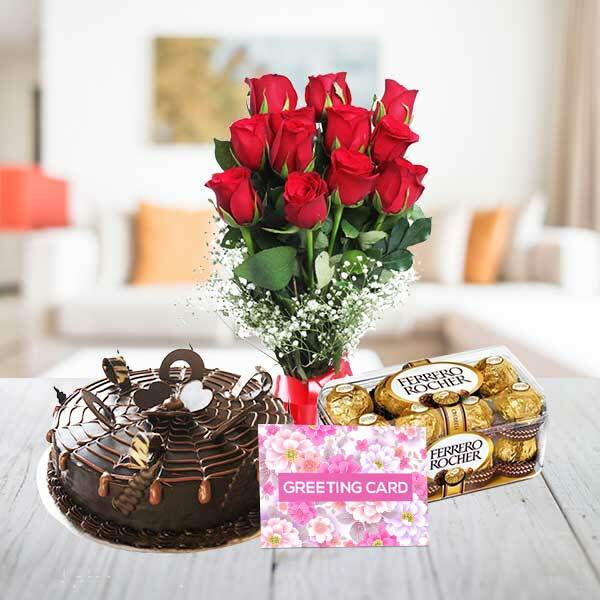 Birthday gift: Cakes and flowers make a perfect birthday gift for someone you love. Cakes are the essence of any birthday celebrations. The aroma of cake and flowers will add to the party mood. So, on your loved one’s birthday tomorrow, order cake and flowers online today. 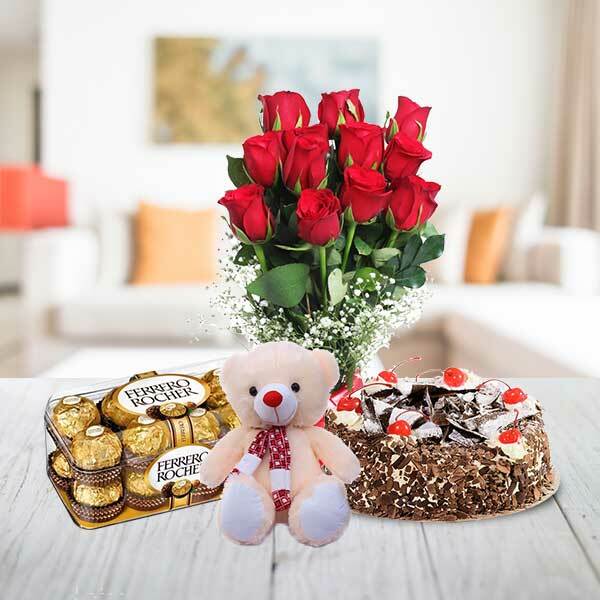 Send cake and flowers online for someone special: Your ‘someone special’ loves you so much. In all these lovely relationships, surprises have their own role to play. 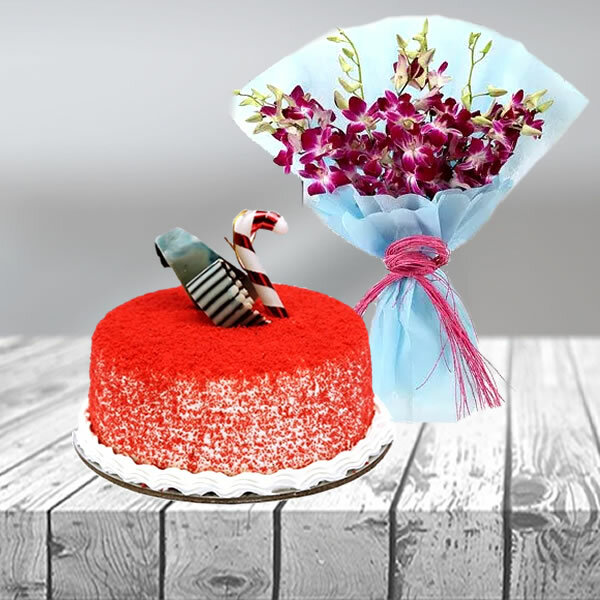 Cake and flowers will be most suited surprise gift for the special person. You will find a variety of flavours in cakes and fragrant flowers to couple with at GiftJaipur. Order the one your special one enjoys the most and rejoice the moment. Gift for the angry soul: Is your girlfriend angry with you? Don’t panicky. We have perfect solution for you. The first thing that you must do to convince her is gift her something. Girls are fond of gifts. Now look at the options here. 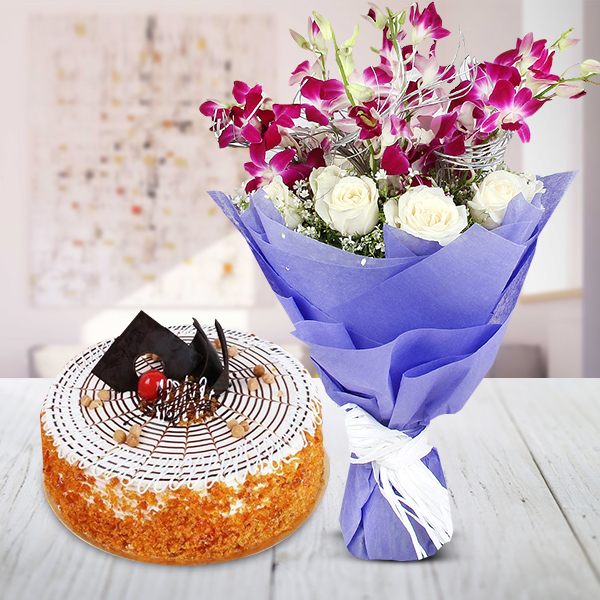 There are many types of cakes and flowers from which you can pick her favourite and gift her. She cannot be angry any longer, we bet. You may want to immediately try this trick, then don’t waste your time. Order your combo now. Cake and flowers with chocolates: Give a chocolaty and creamy welcome to your father who is returning from a long trip. 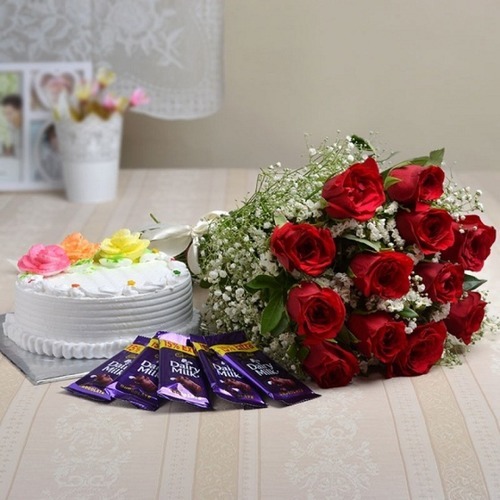 Present some chocolates and his favourite cake flavor coupled with fresh aromatic flowers. He would shower all his love on you for such a warm welcome. Balloons with cake: At a kid’s birthday bash you may not want to look commonplace. So grab this opportunity to select from the menu at GiftJaipur the best combination of customized gift. 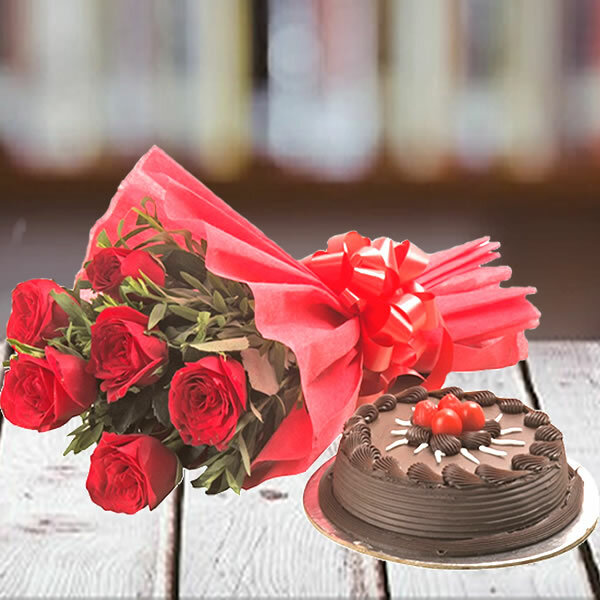 Buy cake and flower combo with balloons. Wouldn’t that be exciting for kids? Further, you may also try the combination with a cute teddy. It would be an amazing party gift for all kids to play around and enjoy. There are different shapes of cakes available with us. You can choose the one that would amaze the kids more. Anniversary gift for spouse: If cakes are your husband’s weakness, then you will surely want to try a heart shaped one especially for your first wedding anniversary. Enjoy the combination of cake and flowers and add few more surprises to your celebration. You can take a red rose bouquet with flowers, or you might want to try the heart shaped bouquet too. A greeting card with a lovely message in it would go very well with your sweet surprise. You surely intend to make this day the most memorable in your life as a couple. Therefore, it will be very important for you to plan carefully. This gift could be the most appropriate idea. We suggest you to try it. You will just need to place and order and leave the rest to us. We will take care that your precious gift reaches you at right time with fine and delicate wrapping. A unique gift for sibling: Cakes and flowers would be an interesting gift for your sibling. Try out a teddy, a butter scotch cake and flowers and be ready to have fun with your sibling. 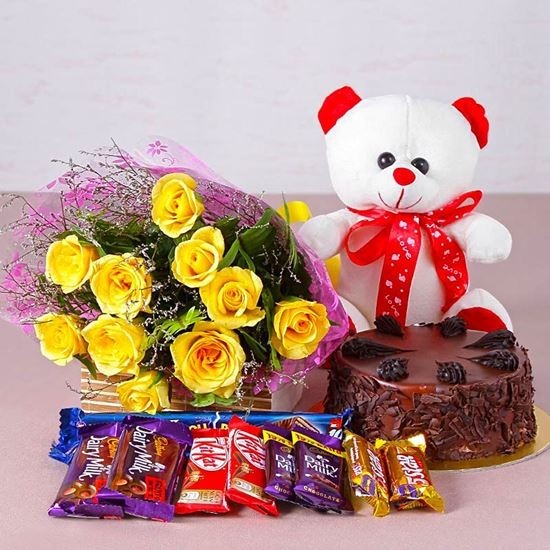 You could also try an adorable teddy with a delicious flavor of cake and perfumed flowers. This combination works well on most siblings. If you are away from your sibling, the teddy will be a right replacement until you return. 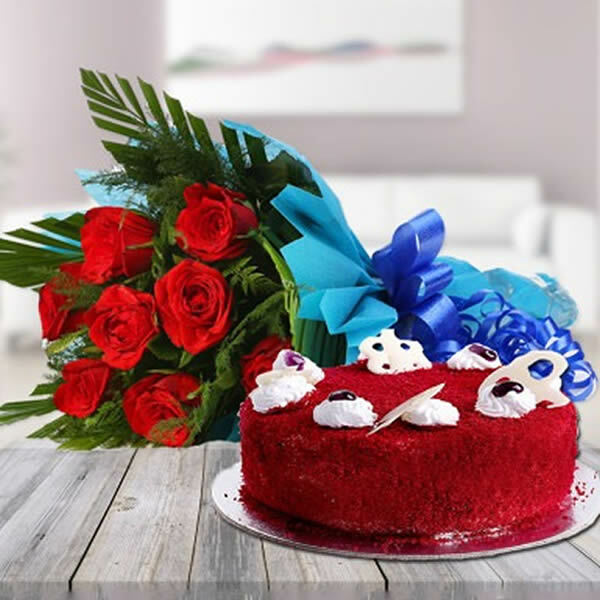 Send cake and flowers online today to your dear sibling. GiftJaipur assures you of quality products, fresh cakes and petals too. We always love to make people happy and be part of their celebrations. And, hence, we take care that you receive your orders in time.